I had some leftover fabric. Originally, I was going to make some pot holders to match my apron. But I had enough of the fabric for pants, so I thought I would give that a try. Overall, I finished the pants within 1-2 hours. Even finishing the seams. 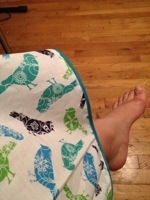 This and the apron was a good project to learn how to use the bias tape. I actually completely messed up some of the apron trimming, if we talk about technique, but I don’t think you can tell very easily. I am quite proud of the job I did for the edge of these pants. Pants was always something I thought would be HARD HARD HARD, and anything fitted is still a challenge. 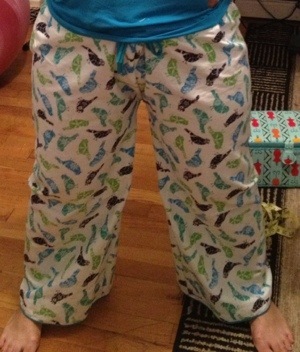 However, I was SUPER surprised to see how easy it was to make pajama pants. I think that might be a new thing for me with friends. Everyone is going to get pajama pants as a Christmas gift. HAHAHAHA. These are really baggy, but quite comfortable, but I will be experimenting with tons of other shapes. I also look like a hobbit in that picture, since it was taken from above. High high above. Maybe I am a hobbit. I was a little embarrassed to post the photos, but oh well.